For this month’s client spotlight we’re highlighting Joe Duenas, another client doing a great job combining features from both our IDX plugin and mapping IDX products into his WordPress site. 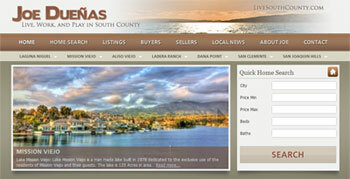 His website LiveSouthCounty.com includes some fun quick search widgets, listing shortcode tricks, and even standard WordPress tools that make for an SEO-optimized site that’s well organized and easy to navigate. Check out the takeaway highlights from his site below, including details on how to recreate some of the same tricks on your own site. Joe’s clean and short site header gives him room for your standard navigation buttons (Home, Search, Contact…), along with a second row of buttons for each city. This added navigation bar shows visitors the area he specializes in at-a-glance (great for validation), and lets Joe add many one-click mls search options for each city without cluttering his page. Joe uses a custom WordPress site from Agent Evolution, but you can re-create this look on your site by adding a sub nav below your existing navigation bar along with a dropdown menu widget like this one or this one. Joe has done a great job leveraging the SearchAgent custom idx link builder to create both “one-click” search links and for specialized shortcode on his city pages. 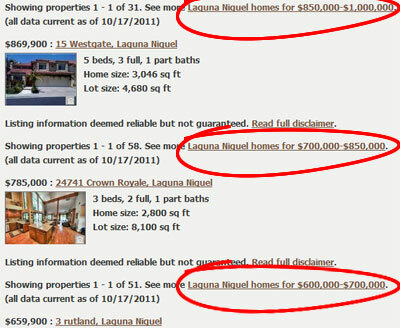 With the help of custom search filters, Joe has setup duplicate shortcode snippets on each page for each price range (ie: “Laguna Niguel homes for $400,000-$500,000”, “Laguna Niguel homes for $500,000-$600,000”, etc). Each shortcode snippet includes indexable listings for a given city plus links to more indexable listings in that city, generating great SEO content for each city page. You can use more than one piece of shortcode on any page or post on your site, it’s just a matter of filtering the properties so viewers (and search engines) are seeing a different set of listings in each shortcode set. 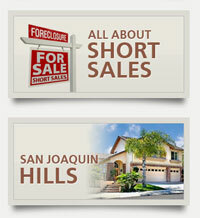 SearchAgent custom search integration can help you fine tune the results for each shortcode snippet as Joe has done. Each city page also has links for “New Listings this week”, “Current Foreclosures” and other one-click search options that link to his mapping IDX search pages. Shortcode can boost your site traffic, but it’s your SearchAgent pages that convert leads, so it’s great to see Joe is giving buyers lots of opportunities to switch over to his mapping IDX pages for optimal conversion. Here Joe has used SearchAgent to create custom search filters based on time on market, price, etc, for each city, and is linking directly to the filtered search results pages. City pages also include our AgentChat widget* for instant messaging and a WalkScore widget for neighborhood statistics. Instant messaging is a great way to engage with visitors who might not otherwise be ready to call or email, and widgets like WalkScore are great ways to add live content to supplement neighborhood pages. Our AgentChat widget is included with all SearchAgent Pro accounts; you’ll find the code to add to your website in your Control Panel. 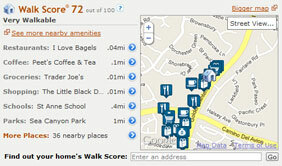 WalkScore offers both a free (ad-supported) and a professional (no ads) version of their Neighborhood Map widget – – Joe’s site uses the Professional version. A marketing plan page for home sellers touts all the great advantages of his website, including the great listing visibility, ease of use, high SEO value, and mobile searching. For agents who work with both buyers and sellers, a page like this is a great way to show off your site and search features to get new listings. Joe’s put together a page promoting the SearchAgent Mobile IDX on his website with pictures, instructions, and a demo link. With links to this mobile page in his sidebar and on nearly every navigation menu, Joe really encourages the use of his mobile site. The mobile IDX product tour on our website has great pics and ideas to use on your site to promote your mobile IDX search. A quick search, mobile IDX “ad”, and links to post categories from his sidebar help promote access to specific parts of his site and help with overall conversion. Using big images or “ads” like these for each link help really help catch reader’s attention. Joe’s sidebar uses our standard SearchAgent “Quick Search” widget along with some custom CSS; and he’s created his own custom images to use as “ads” or buttons that links to different sections of his site. We hope our spotlight this month has given you some new ideas for WordPress IDX integration with your real estate site and look forward to your feedback and comments!